Considering crazy foods like chocolate-drizzled fries, buckets of fried chicken and cheese, and 48-piece Chicken McNugget meals, sometimes it feels like McDonald's launches its most exciting new creations outside of the US. But now, it looks like the fast food empire is working on a significant new addition to its all-day breakfast menu Stateside -- one you could only previously get through surreptitious means. Dubbed as the "Chicken McGriddle," the new breakfast sandwich basically combines the syrupy pancake buns of the original McGriddle with the fried chicken patty used in the McChicken sandwich for perhaps the ultimate all-day breakfast/lunch menu mashup. As reported by Columbus Business First, the sandwich is already being tested at 11 McDonald's locations in the Columbus, OH area, but there's a chance it can land a wider rollout depending on the response there from customers and how many are sold. Brian Mortellaro, a franchisee who is spearheading the project, likened the sandwich to a beloved Southern breakfast dish, saying "It’s a chicken-and-waffles taste," per the report. However, it's worth noting that the Chicken McGriddle is by no means a "chicken-and-waffles" sandwich, seeing as the McGriddle buns are more like pancakes and not waffles. 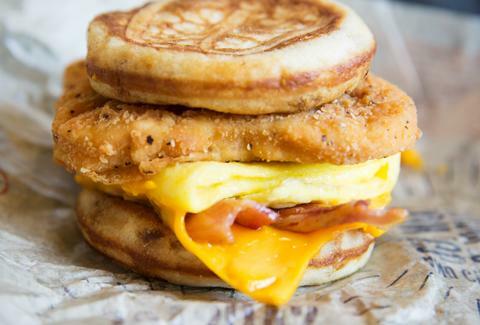 Further, it appears that the sandwich is either the same or similar to the Chicken McGriddle (pictured above) that you can already order from McDonald's unofficial secret menu. While the Chicken McGriddle sounds great (and the one we ate was damn tasty), an actual chicken-and-waffles sandwich would be a zillion times better. But, ultimately, we really wouldn't mind being able to order this thing from the official menu. Tony Merevick is Cities News Editor at Thrillist and loves a good chicken and waffles -- that is, the actual dish. Send news tips to news@thrillist.com and follow him on Twitter @tonymerevick.